Fitbit's latest wireless activity tracker, the Force, includes a built-in altimeter and has an OLED display. A button on the side of the device cycles through the display, similar to how the company's One tracker operates. The Force will display steps taken, distance travelled, calories burned, active minutes and floors climbed. It will also display the time. The floors climbed statistic is made possible by a built-in altimeter, a feature that's not available on the current Fitbit Flex wristband. A software update will come soon after launch that will allow iOS 7 users (with an iPhone 4S and above) to be notified of incoming calls on the Force's screen. The device will vibrate and display the name or number of the caller. Unfortunately, you won't be able to answer or reject any incoming calls through the Force, and the feature will be iOS-exclusive at launch. There's no word on future Android compatibility. The Fitbit Force comes with previous Flex features including the ability to monitor and track sleeping patterns, and a silent wake alarm that will vibrate when set. The Force will synchronise wirelessly with compatible Bluetooth 4.0 smartphones, including the iPhone 4S and above, and a selected range of Android phones. 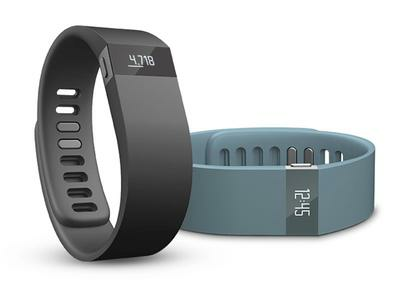 The Fitbit Force will launch in Australia in "early 2014" and will come in two colour variants — black and slate. The device will cost $169.95 and will be available through Apple Stores, Harvey Norman retail outlets and through Fitbit's online store.